tell me where and how to purchase this and how much? very cool! any chance you will be publishing instructions for building? I’ll definitely publish a schematic as it’s really straightforward. The code is already linked from the site. The housing/mounting is the real challenge now. Juan, I don’t plan on selling kits, but my final howto will have a list of materials so you can make it yourself. Great project!! Very cool. I skimmed over the code and it seems you are using digital outputs and controlling the fade by “blinking them” at different frequencies, is that correct? Did you considered using a capacitor to control the fade? Thanks again, great project. Long live the Arduino. Love your project and thanks for including the code. I am however having trouble as it won’t verify in my Arduino 10. This error highlights the top line of code. Very cool.Just tell how much and how to get it. inst of it moving from the sides in. can u make it move bak and forth like the real kitt? Any progress with the schematics? I found your project from the YouTube video and it\’s definitely what I think to be the best of what I saw (exception being the one from the guys that made the one for the movie- but theirs is way more complicated). I would really like to build one of these, but subing blue for red. Also, is 18 the max number of LED\’s the Diecimila will support? But anyhow, only thing keeping me from ordering up a Diecimila is lack of schematics- waddya say? NY UPDATE ON SCHEMATICS, JUST INTERESTED IN LED VALUES AND WIRING DIAGRAM. You did a great job of course, now what we all have been waiting for is the schematics, no need to make it pretty, draw it on a piece of paper and scan it, we\’ll all be happy and then can actually emulate your project thus making you a hero to the most likely thousands of people that have been waiting for you to post the schematic. heres a link most might find useful, its a place to buy a kit to build the arduino. Love to know the schematic for this… when would you post it… I would be so grateful. What does the code mean> Im noob! i would like to q’s abt the board. how many lcd can be supported by single Arduino Diecimila board? Have you replied to anyone with a price? I want to grab this from you. I really don’t know anything about electronics or programming any circuit boards! Have you made a sellable version. Hey, just wondering if you could shoot me an email on this project… just wondering if you ever finshed yours? Im very very interested in building this but i want to try it in ultra white LEDs. I have modified Leds to the entire interior of my car but have absolutely NO clue how to put together with the control unit. Really wanna have a go though. Love the effect you have created, its almost biomechanical ethereal and gives it a real sense of intelligence. Any chance of seeing how to put one together? would love to see a circuit diagram 🙂 will this work with 12V ? very cool! Im very very interested in building this circuit. Hope you can share the schematic . I just learn about PIC controller. I will share the knowledge in my blog. very cool project. 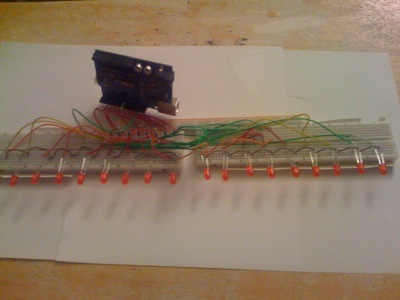 I’d like to try to built it for myself, but as I’m a complete newby in arduino and simply have done some first tutorials with leds, please can you show a schematic sketch for how to wire the whole thing? Please! Nice creation . Good idea.